“You changed your hair,” Han Solo (Harrison Ford) tells Leia Organa (Carrie Fisher) the first time they see each other in Star Wars: The Force Awakens. “Same jacket,” Leia replies, eyeing his garb. It’s a moment that wouldn’t feel out of place in Richard Linklater's Before Trilogy, the sort of warm yet uneasy exchange between an estranged couple still harboring mutual affection. But their references hold particular import in the Star Wars ethos, for those who recall Leia’s iconic hair buns and Solo’s trademark black jacket. These dual concepts of legacy drive The Force Awakens, both set and released about 30 years after The Return of the Jedi. It’s a film focused on fate and family. Like Creed, it’s also aware of its wider cultural significance and leverages the same. Under the direction of J. J. Abrams, this Star Wars is still an epic space adventure but with a slightly harder edge. The film opens with a My Lai-type massacre, executed by Stormtroopers who actually shoot straight and bleed. The carnage shakes the resolve of one, nicknamed Finn (John Boyega), who becomes a conscientious objector and aids the escape of ace starfighter Poe Dameron (Oscar Isaac) and eventually Poe’s BB-8 droid carrying Vital Information™. Finn’s odyssey soon crosses paths with Rey (Daisy Ridley), a young raider on the planet Jakku who scrapes by scavenging parts off derelict starships half-buried in the desert’s sands. The Force Awakens lifts the narrative elements of A New Hope, adds a dash of The Empire Strikes Back and Return of the Jedi, then puts them in a blender for a sequel that’s not an upheaval, but rather one that splendidly repackages the Star Wars saga. The erstwhile Civil War between the Rebel Alliance and Galactic Empire has morphed into a clash between the Resistance, dedicated to the Republic, and the First Order, which adopted the mantle of the Empire. The First Order’s “emperor” is Supreme Leader Snoke (Andy Serkis in motion-capture), while its dual commanders are General Hux (Domhnall Gleeson), the Tarkin of this story, and Kylo Ren (Adam Driver), a cruel, masked discipline of Darth Vader skilled in the Force's dark arts. There’s a cantina scene; Jakku is basically Tatooine; icy detours recount Hoth. There’s a bigger, badder Death Star, yet with only a fraction of the buildup of the previous ones. “How do we blow it up? There’s always a way,” Solo almost quips as the Resistance plans their attack on this latest planetary war machine. And there's a search for a self-exiled Jedi, this time Luke Skywalker (Mark Hamill), a mission announced during the film’s opening crawl and the closest thing to an Abrams-esque MacGuffin in this tale. From another viewpoint, The Force Awakens is how A New Hope would have felt had it been made and released after the comparatively antiseptic Episodes I-III. The film's true force is found in the ties between characters and their destinies, the perpetual struggle between good and evil and the film’s unavoidable intersection of nostalgia and discovery. A chase through a canyon of derelict Star Destroyers is a plaintive backdrop for thrilling action sequences that marry new age technology with old school visual effects like models, expansive sets and matte paintings. 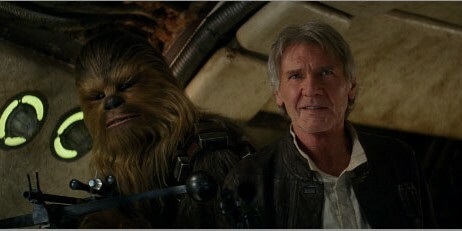 It’s great to see Harrison Ford finally having fun again, and Fisher now looks and sounds like her mom, Debbie Reynolds. Yet Ridley is effervescent, holding her own physically and when Rey must match witticisms with Solo (no easy task). Both she and Boyega are new protagonists for a new generation of fans. It’s also a milieu where Luke Skywalker is regarded as a “myth” and Han Solo the stuff of bygone legends. The Force Awakens isn't a great movie—the storyline is openly derivative and grows repetitive over the final third, with the trademark cross-cutting battle scenes coming at the expense of the fertile character development. But it's a great Star Wars movie, building on its mythology in the best tradition of epic storytelling. When Solo declares, “Chewie, we’re home,” as the smuggling duo finally returns to Millennium Falcon for the first time in decades, it feels like he’s speaking for all of us. I love Han Solo Episode 7 Star Wars The Force Awakens Brown Leather Jacket. I bought his best replica exact match jacket from this site: Han Solo Jacket.